In experiments, a Leopard Coral Trout, left, easily intimidated predatory Fuscus Dottybacks, taking pressure off juvenile Ambon Damselfish, right. The ancient, classic rule of Big Fish Eat Smaller Fish still holds true, but the balance of power on a coral reef among fishes of difference sizes is much more complex than ever previously imagined. Scientists in Australia have discovered that the presence of large fish predators can reduce stress on baby fish that live in mortal fear of being preyed upon by intermediate-sized hunters. Researchers from the ARC Centre of Excellence for Coral Reef Studies at James Cook University and the University of Glasgow have found that physiological stress on baby fish can be reduced by more than a third if large predatory fish are around to scare off smaller, medium-sized predators, known as mesopredators. Juvenile Ambon Damsels: tended to relax and grow faster in the presence of a predator large enough to ignore them. To obtain these results, scientists exposed baby Pomacentrus amboinensis, Ambon Damselfish, to combinations of sensory cues (including visual and scent cues) from small and large predators. Detailed measures of the behaviour and oxygen uptake (as proxy for “stress”) of the baby fish enabled researchers to understand the cascading effects that predators throughout the food chain can have on newly settled baby fish on the Great Barrier Reef. JCU collaborator, Lauren Nadler, said the baby fish were very scared in the presence of mesopredators (Pseudochromis fuscus) alone. However, all of the physiological stress disappeared if they added a large predator, such as the grouper Plectropomus leopardus, which effectively suppressed all mesopredator activity. “By scaring the mesopredator, it seems as if the large predators are helping the baby fish keep calm and relaxed. They don’t need to worry anymore about the constant chases and threats from mesopredators”. Experimental set-up used to assess the indirect interactions between a three-level food web of coral reef fish. The set-up includes (a) a top predator tank to hold the top predator (coral trout, Plectropomus leopardus) or the non-predator (thicklip wrasse, Hemigymnus melapterus) and (b) a mesopredator tank where the mesopredator (dottyback, Pseudochromis fuscus) or the small non-predator (goby, Amblygobius phalaena) could swim freely and interact with top predator and/or prey. Each mesopredator tank contained a layer of sand, a shelter for the mesopredator, a resin branching coral and a respirometry chamber to hold the resource prey (damselfish juveniles, Pomacentrus amboinensis). A removable opaque panel was positioned between the top predator and mesopredator tanks (grey discontinuous line) allowing an exchange of visual cues only when it was removed. 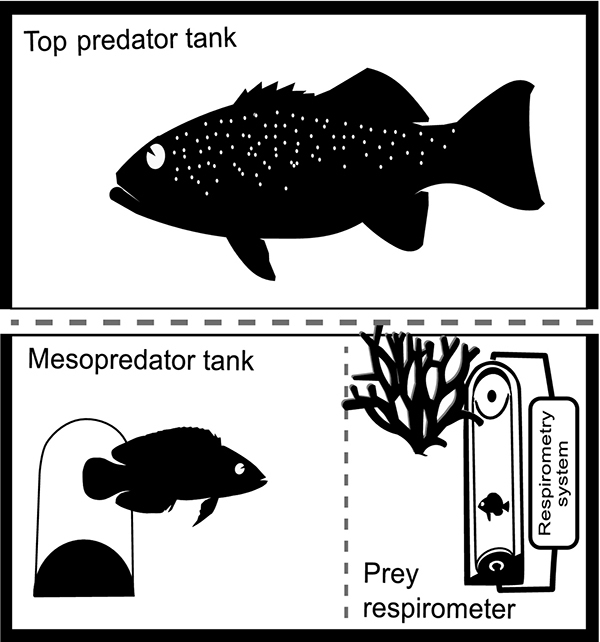 A second panel divided the mesopredator tank, and only with its removal could the mesopredator approach and interact with the damselfish. As with humans, it’s expected that a reduction in physiological stress should benefit their fitness and well-being. “Animals have finite energy budgets, so by reducing the energy invested in anti-predator responses, baby fish should be able to invest more energy in growth and storage,” said Dr. Shaun Killen, a fish physiologist from the University of Glasgow who also collaborated on the study. Professor Mark McCormick, who supervised the research, warned that although these findings are exciting from an ecological point of view, they could carry grave consequences for the balance of marine ecosystems. “The ongoing overexploitation of large marine carnivores might allow an explosion of smaller, active predators that could not only kill, but also stress the population of baby fish that remain,” he said. 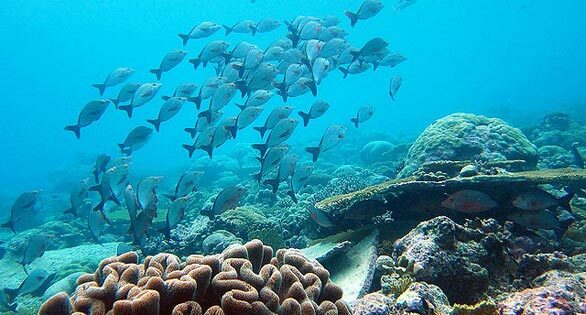 For reef aquarium keepers, the research may suggest the need to plan fish populations with greater care. It is becoming increasingly clear that wild reefs that have larger predatory fishes present tend to be healthier, and some aquarists may want to rethink the temptation to stock a tank only with the smallest, least predatory species. 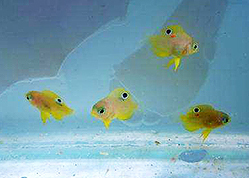 Juveniles of the common Indo-Pacific damselfish, Pomacentrus amboinensis, were used as the resource prey. 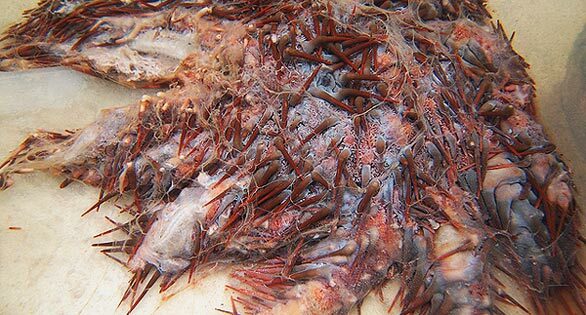 This benthic species is a site-attached omnivorous demersal spawner with a bipartite life history. When the larvae (10–15 mm SL; Kerrigan 1996) settle to shallow reefs during the austral summer months (October–January), they are subject to extremely high rates of predation by small reef piscivores such as cods, dottybacks and lizardfishes (Almany & Webster 2006). These damselfish juveniles can learn to recognize reef predators, have strong anti-predator behaviour and exhibit threat-sensitive responses to predation risk (Holmes & McCormick 2011). The dottyback (Pseudochromis fuscus) was used as the focal mesopredator species, as it is a small (10 cm TL) site-attached carnivore that voraciously consumes newly settled fishes using ambush and pursuit techniques (Feeney et al. 2012). It acclimates well to aquarium conditions and is known to respond to visual and chemical cues from top predators (Palacios, Warren & McCormick 2016). The leopard coral trout (Plectropomus leopardus) was used as the top predator species. This large (>30 cm SL) reef piscivore is relatively common on the Great Barrier Reef (GBR; Ayling, Samoilys & Ryan 2000) and consumes predominantly small-sized reef fish (3–7 cm SL; St. John 2001). The non-piscivorous reef fish species selected to experimentally control for the presence of the meso- and top predator were the white-barred goby (Amblygobius phalaena) and the thicklip wrasse (Hemigymnus melapterus), respectively. The goby (<15 cm TL) feeds mainly on algae and copepods (Sano 1984), while the wrasse (>30 cm TL) usually consumes small crustaceans, polychaete worms and molluscs (Randall 2013). Although both non-predators are frequently found around patch reefs and in close proximity to newly settled fish, they are not known to prey on them. 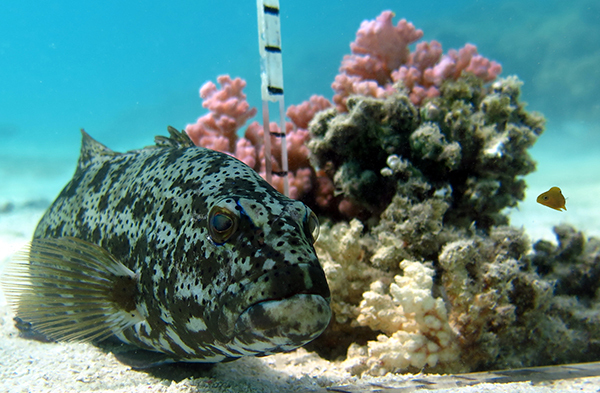 All fishes were collected from the lagoon of Lizard Island (14°40′S, 145°28′E), northern GBR, during the second week of November 2014.